+ 6 = thirteen Required Please enter the correct value. Shares of Shake Shack Inc. (NYSE: SHAK) have been exceptionally volatile lately after last week's new Shake Shack stock prediction. The Shake Shack stock price opened 6.3% lower today (Monday) at $51.63. At 12:27 p.m., the price fell 10% to an intraday low of $49.81. Today's drop came after Cowen Group Inc. (Nasdaq: COWN) initiated coverage on the company last Friday. Cowen gave the New York-based burger chain a rating of "market perform" – similar to a "Neutral" rating – and a price target of $42 a share. Although SHAK stock surged 13.3% higher on Friday, Cowen's price target was actually a bearish estimate. The $42 projection is 13.7% lower than $48.67, the last closing price before the bank released its report. It's also 22% lower than today's opening price of $53.78. 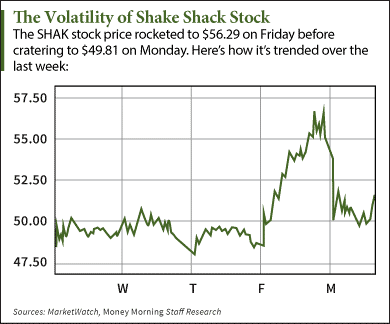 Money Morning Chief Investment Strategist Keith Fitz-Gerald was ahead of this Shake Shack stock prediction. He warned us back in May that shares would eventually crater over the long term. That's because Shake Shack's rise has come from nothing but conjecture. It's a prime example of the market's inclination to give hyped-up stocks an absurdly high valuation. "Shake Shack remains a highly speculative company at best, and not the investment millions of people think it is," Fitz-Gerald explained. Alex McGuire is an associate editor for Money Morning who writes about IPOs. You can follow him on Twitter at @AlexMcGuire92 for all of the biggest IPO updates.